We are relational beings, living in a relational universe. Embodying relational intelligence and becoming fluid in the relational field can be soul food that softens and warms our hearts, and delivers us into our most fulfilling, joyful and meaningful life. The dance floor is a wonderful place to explore this sacred mystery of Self and Other, as well as that mysterious place where the sense of separation finally dissolves into Oneness. Our task as humans is to practice the fine art of balancing all four of these hungers in our lives. Each offers deep medicine and soul food. When we feel out of balance in any one of these areas, we generally feel out of sorts. Most of us are strong in some areas and weak in others. What are you hungry for in your life right now? Let’s dance together and find out. All warmly welcome. Come just as you are. 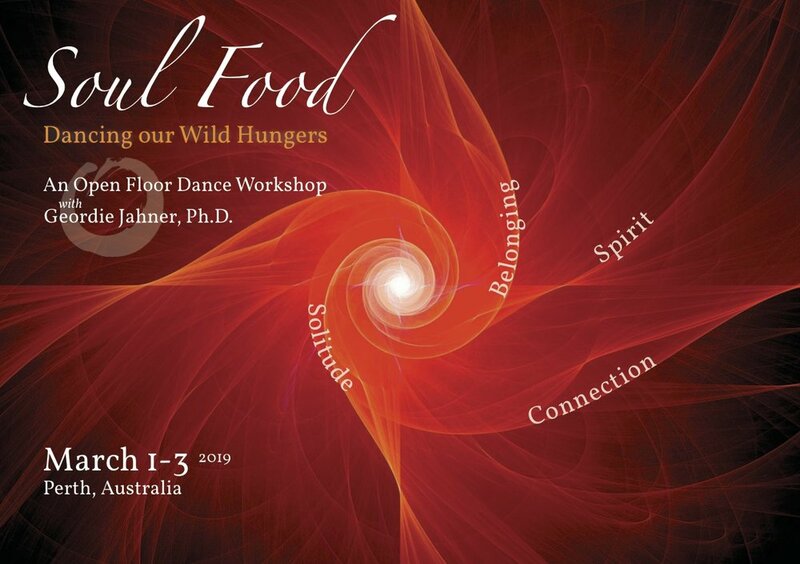 Geordie Jahner, Ph.D. (Psychology), is a dance artist, educator, facilitator of conscious dance practices and expressive arts therapist. Formerly a professional modern dancer and dance teacher, Geordie is passionate about the exploration of dance as a healing art and as spiritual practice. A Founding Member of Open Floor International, she currently leads workshops and trainings internationally teaching Open Floor Movement Practice primarily in Maui, Hawaii & New Zealand. This workshop counts as 15 hrs towards Open Floor teacher training pre-requisites or elective study.